If you looking for a holiday destination where you can eat, see the sights and combine it all with outdoor activities, then this country house is the right place for you. The central location gives you options for excursions to cities in Tuscany, Assisi, Perugia, Orvieto and Lake Trasimeno. It is a wonderful location, located in the hills and beautiful natural surroundings. The charming and friendly atmosphere is increased by the friendly and welcoming home-owners. They know the area well, and have great tips for perfect excursions to the local wine grower, the caves of Frasassi or walks in the area. The rustic country house is renovated and consists of five apartments, all with all possible luxury to make your stay as comfortable as possible. The furnishings are rustic with Italian allure. The country house is located near the centre of Pietrafitta and close to the Abbadia dei Sette Fratti, an 11th century abbey. 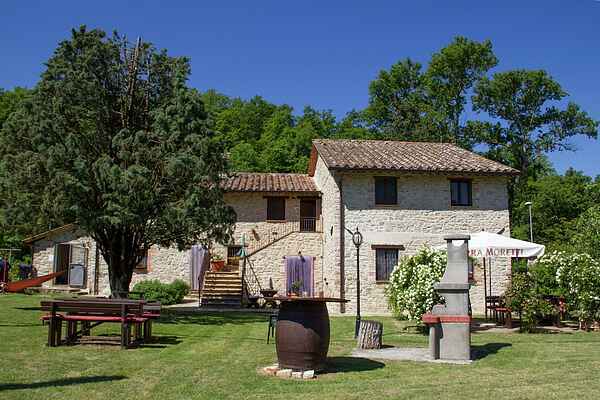 The country house is located a bit to the south of Lake Trasimeno. Pietrafitta is a small charming village 270 metres above sea level, nestled within forested hills. There is still no pool on the property, but there is a pool with big water slides in the area. There are opportunities in the area to cycle, fish for carp, walk and golf.